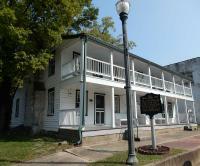 The Old Stagecoach Stop is the oldest publicly accesible building in Pulaski County. Built in the 1850's it was originally a stagecoach stop, then it became a hospital during the Civil War, and then a hotel and apartments until it fell into disrepair and was condemned by the city in 1982. It was purchased by The Old Stagecoach Stop Foundation, a group formed to save and restore the building to its original glory. As a museum, each room represents a different era of its history. As you tour the building, you can learn its rich history and help preserve it for future generations. To preserve the educational value of The Old Stagecoach Stop for future generations.